This little movie, which may have missed a theatrical release, makes an interesting rental if you're looking for some hard-core morality discussion about the philosophical issue of the efficacy of torture. That is, if you don't mind sitting through two hours of a stage-play version of pretty intense, physical torture and murder. Carrie-Anne Moss (The Matrix) stars as agent Helen Brody, an FBI agent who's assigned to track down the location of three nuclear bombs that have been hidden in three American cities, threatening to go off in precisely 48 hours. Meanwhile, the terrorist - Steven Arthur Younger (don't you love how terrorists get three names? ), who is played with an effective Midwestern accent by brit Michael Sheen (Frost/Nixon, Underworld), happens to be held in custody by the Feds at a high school in California. 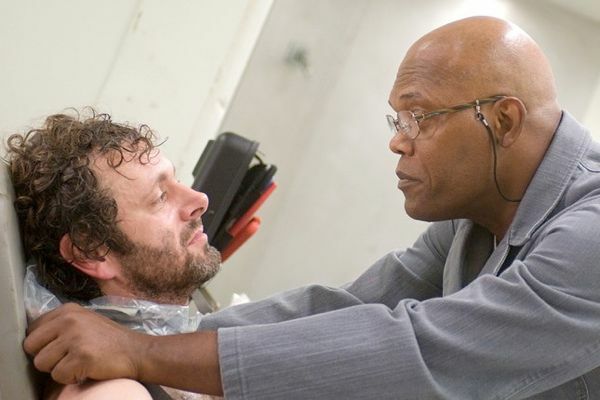 Brody is called in along with Samuel L. Jackson (as "H"), a mysterious character who happens to be a master torturer, and whose handlers set him to work on Younger in order to break him down. While the premise seems like a B-movie version of an episode of 24, the movie is less interested in the ticking clock and the slow suspense of tracking down the bombs than it is exploring the arguments for and against torture, with Brody being maneuvered to play the good cop to H's very very very bad cop. H begins his torture session by chopping off Younger's pinky - and let me just say, it goes on to get worse from there. This isn't a movie for the squeamish. This seems to be precisely the point, as H relents his physical abuse at key points so that Brody can go in and talk reasonably, cajole, and otherwise serve as an emotional counterpoint to help break the terrorist down. She doesn't like participating and wants to stop it, but the orders come on from on high: as long as they are getting information, and possibly saving millions of lives, any level of physical abuse is worth it, or so the American officials argue. Younger argues (in his abused state he's still somehow able to deliver the type of clearly reasoned counterpoints that usually only come out of Sophomore year-end theses) that the physical abuse only goes to prove how depraved Americans have become. What they are doing is merely another form of murder and terrorism. With all the action taking place on a stage in the gym of the high school, I wondered throughout most of the film if this wasn't the film version of a stage play. I couldn't find a reference to an original anywhere, but the talkiness of the torturers and the limitation to what's basically a single set gives the film the feeling of issue-based theater. It drove me a bit crazy that with only 48 hours, we never see Brody or her team actually go and do any detective work. Instead, we only get the torture question, and all is left to ride on whether Younger will break. The movie wants to shove us into a narrow funnel that isn't really realistic, but is designed to press a very specific ethical question: how far is it ethical to go in using physical torture and terrorism to extract information designed to save a great many more people from the threat of physical terrorism? Some will naturally want to argue its not ethical to go there at all, but to me, the real question is whether the moral questions about torture posed by the movie are the right questions in the first place. Brody argues that torture is ineffective - though H does eventually manage in the end to come up with a Jack-Bower-like gambit that gets Younger to confess, well, most of what they want to know. But the confession comes only because Younger - as well as Brody and the American handlers - have become convinced that H is capable of any act of barbarity that will make Younger talk. The movie wants us to understand that in the end, there's no reasoning with terrorism: the only thing a terrorist understands is more terrorism. What I find unfortunate is that while the movie slowly doles this insight out as some piece of hard-learned wisdom, it seems that Americans are only starting to come to the beginning of a question that has vexed Israelis for fifty years. If the only way to combat terrorism is with terror, we are surely in for a cycle of endless bloodshed and vengeance. This is in fact no answer, but only the beginning of what's indeed a very thorny problem for any modern society that bases itself on democratic values. The movie is at least willing to start to ask those serious questions, however. Unlike 24, it's not just a pop-terrorism for entertainment. That's why I think it's of note, and possibly worth renting, if you have the stomach for it. Stilted as the dialogue is as a morality tale for the political set, and implausible as the set-up would seem, Moss, Jackson, and Sheen all give fine performances. If you make it all the way through the end, it will surely give you something to talk about. Easy A: Sluts and Nerds Rule!